We try to attend each of ROCK’s monthly launches in Oviedo, Florida. At this month’s launch was a reporter, Caitlin Dineen, from the Orlando Sentinel newspaper. She interviewed several of the launch participants including our club’s president, Brian Coyle. Jordan Krumbine, the Sentinel photographer, took photos of people prepping rockets for flight, launching rockets, and watching the flights. Carl Campbell, of Real Space Rockets is featured in one of the photographs. 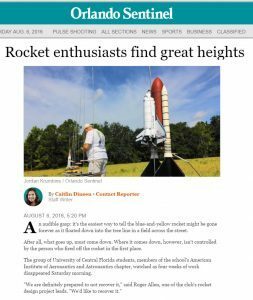 Later the same day, Dineen’s artice, titled “Rocket Enthusiasts Find Great Heights,” appeared in the Space News section of the Sentinel’s web site. The article includes a gallery of the photographs taken by Krumbine. This entry was posted in Local Launches, News by Roger. Bookmark the permalink.